After being insanely excited about this NIOD launch for months, of course it would finally happen during my unplanned and longer than expected Insta-break in November. I had initially planned to write about it in time for launch, but that sadly didn’t happen and I am very sorry because I know how many of you were waiting to hear more about it. I got a lot of DMs and emails about CAIS2 while I was away, so in this post I want to address the questions that were asked, share my experience with the new formula and give a comparison to the 1% and 5%. 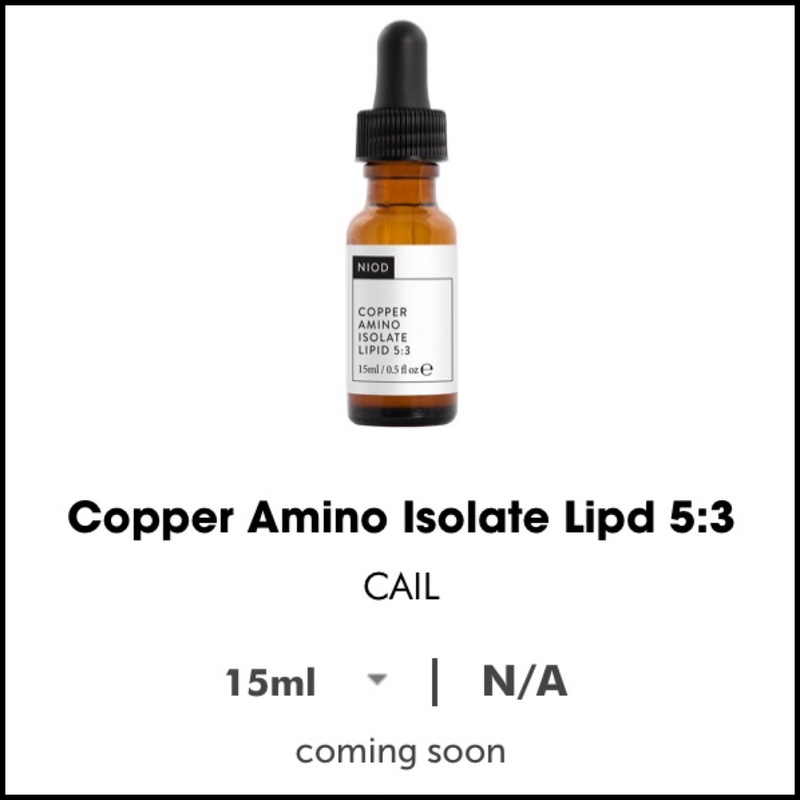 At this point it goes without saying that CAIS/copper is one of my all time favourite products and ingredients. It is what my skin was missing before it came along and having used it on and off since the first launch back in 2015, I can confidently say it still makes a difference. I saw great results within a few days of using the original 1% formula, then even better ones when I started on the 5% and now this has proven to be the perfect happy medium. One of the most asked questions about this new version was about the consistency of the formula. Many of you worried that it would be thicker or not absorb as fast, but thankfully it is exactly the same as the 1%. It mixes in the same way, has the same watery texture, the scent is the same and it absorbs just as fast. It is the same product so many of you have come to know and love over the past two+ years and any differences have so far been positive ones in my experience. 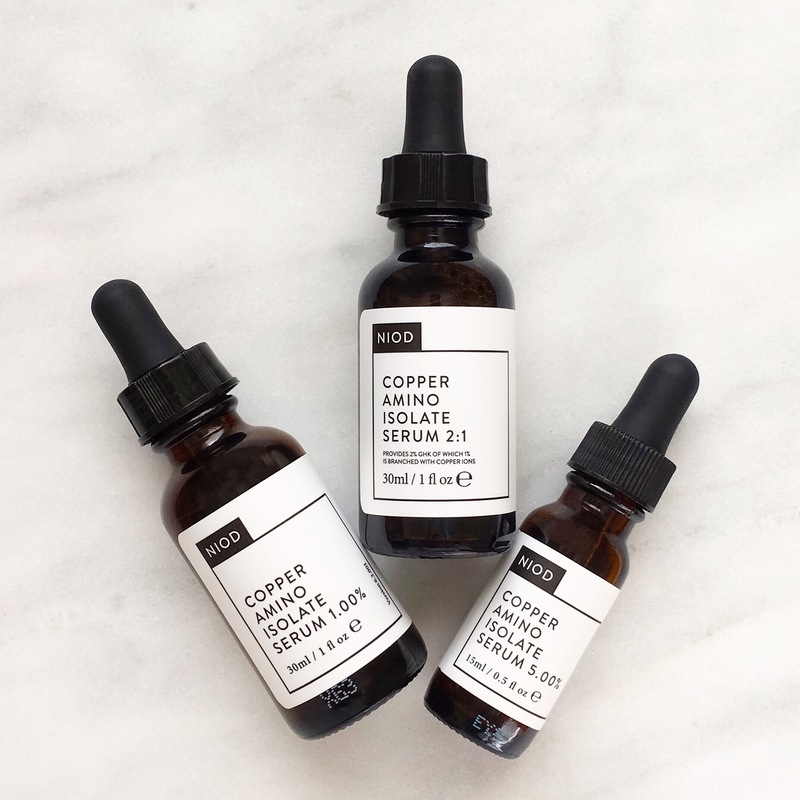 The big difference about this new product is that it is not a second version of the 1%, but the first version of a 2% strength brand new and different replacement copper serum and the 2:1 in the name comes from the 2-to-1 ratio of GHK to GHK-Cu. 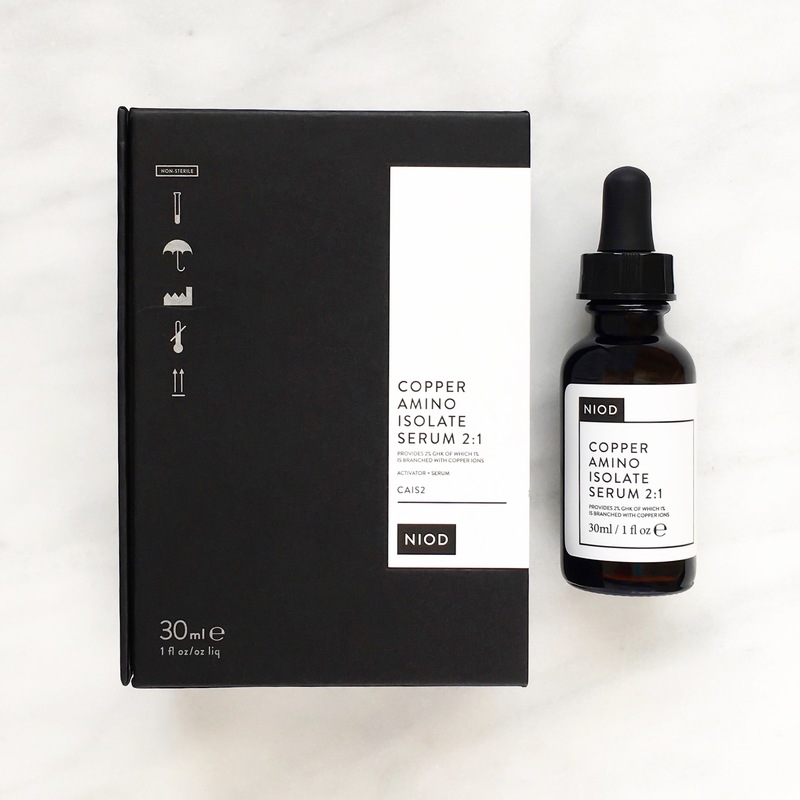 NIOD explain that, “the Activator contains 2% pure GHK (Tripeptide-1) and the Serum bottle, before mixing, contains Copper Gluconate (copper salt of D-gluconic acid). Once mixed, 1% GHK is left in free form, while 1% binds to the Copper Gluconate to form 1% Copper Tripeptide-1 (known as GHK-Cu or Copper Peptides). I know a few of you were confused on this point, so I want to make it clear that this serum now contains “2% of pure GHK peptide”, which I am very happy about. This update means that CAIS now works even better to improve skin health through increased accelerated healing and inflammation reduction as well as amplified collagen synthesis and fibroblast production (connective tissue cells that maintain structural integrity and is important in wound healing). It will still work to address uneven skin tone, enlarged pores, hyperpigmentation, wrinkles, texture, elasticity and more just like the original, but in a more superior way. It is packed full of advanced peptides making it even more of a pro-health, pro-healing and pro-collagen skincare essential. Another good thing is that 2:1 has a more stable pH (between 4.5 acidic and 7.4 alkaline) than the previous formula meaning those who love to use acids, or don’t have the time to wait to apply their next product don’t have to worry about rendering CAIS ineffective. I still wait a few seconds before I move on to the next step in my routine, but now it’s less than 30 seconds instead of at least 30. 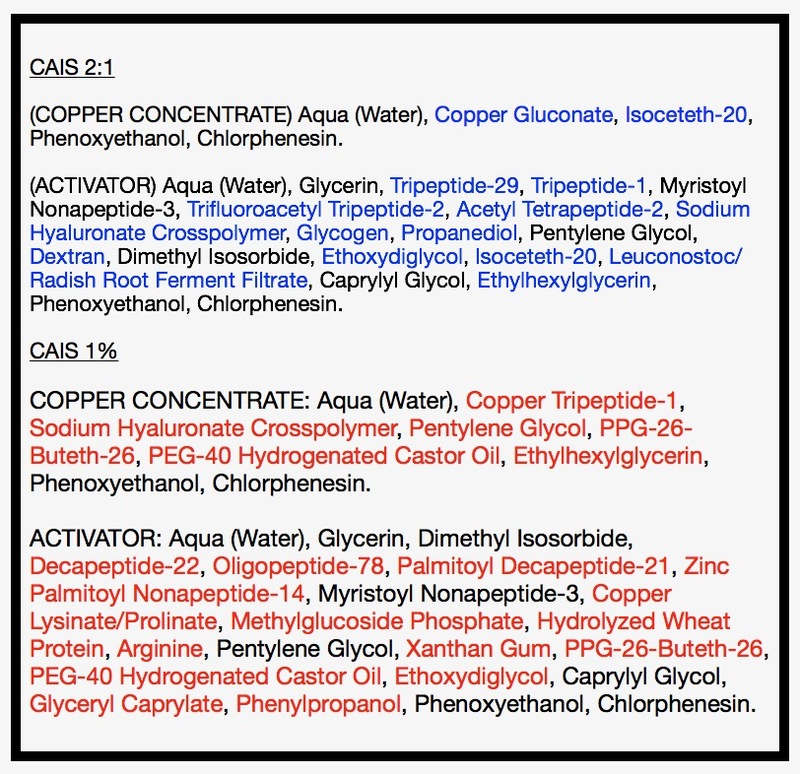 Above I have highlighted the differences between the most current version of CAIS 1% and the new CAIS 2:1 (blue is for new ingredients and red is for omitted ones). CAIS 2:1 seems like a more selective and organized formula with some ingredients being moved from the concentrate to the activator as well as what’s been added and removed. Changes like no longer including hydrogenated castor oil is a big plus for those who don’t get along with that ingredient and obviously the added GHK should mean that those who felt that CAIS didn’t anything for their skin will mostly likely have a better experience with this. I definitely found that with the 1% I eventually saw less short term visible results over time, but without it my skin was not happy, so I knew it was still “working”. With the 5% I got those visible results back and they were maintained for many months, until again I reached the point where the serum was more maintaining the health of the skin rather then actively improving it, but to be honest because of using it there was less that needed to be improved, so that change in performance made sense. 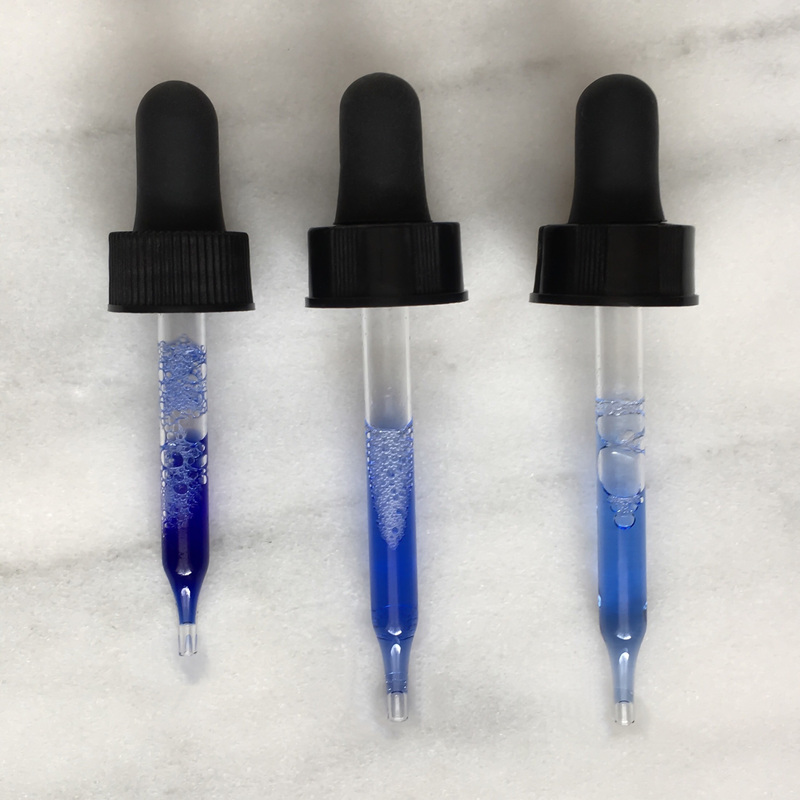 As you can see from the picture (above) there is a clear difference in colour between the three serums, so there is no doubt that each one contains different strengths of copper. I honestly thought that I would still want to use the 5% every day, but now I feel confident that I can use the 2:1 daily and save the 5% for emergencies like allergic reactions to products, healing any picked blemishes (yes, I sometimes still do it, but it’s been months since the last time thankfully) or for something new I am trying, which I will tell you all about soon. Now the 5% is reserved for those occasions as well as seasonal or monthly “boosts” and I actually prefer using it in this way because I get to see those quick visible results again, plus this now the serum last longer and making it well worth the price. I have been loving 2:1 ever since it arrived and it has given my skin the perfect balance between the 1% and the 5%. Many of you asked if you should get this new version or the 5% and I would definitely recommend this now. It’s more advanced than the 1%, so everyone should see the benefits and it’s much cheaper than the 5% making it a better choice for daily use. I have been happily using the lower strength on a daily basis and I like that this has been giving me visible results as well as maintaining my overall skin health. If you are new to CAIS/copper I have a full review on the 1% (here) and 5% (here) that you can read for further insight on them and what I thought. During autumn/winter my combo skin is more on the drier side and I like to focus on dealing with any summer pigmentation, so the above routine has been perfect. I’ve got CAIS to heal and maintain skin health, RP to address hyperpigmentation, MMHC2 to support barrier function and keep my skin hydrated and then Surival 20 (my favourite) for an antioxidant sunscreen powerhouse. Thanks to all the launches my morning skincare routine has totally changed by becoming more streamlined yet still highly effective. Since around September I have been using these four (above) pretty much every day and my skin loves it. 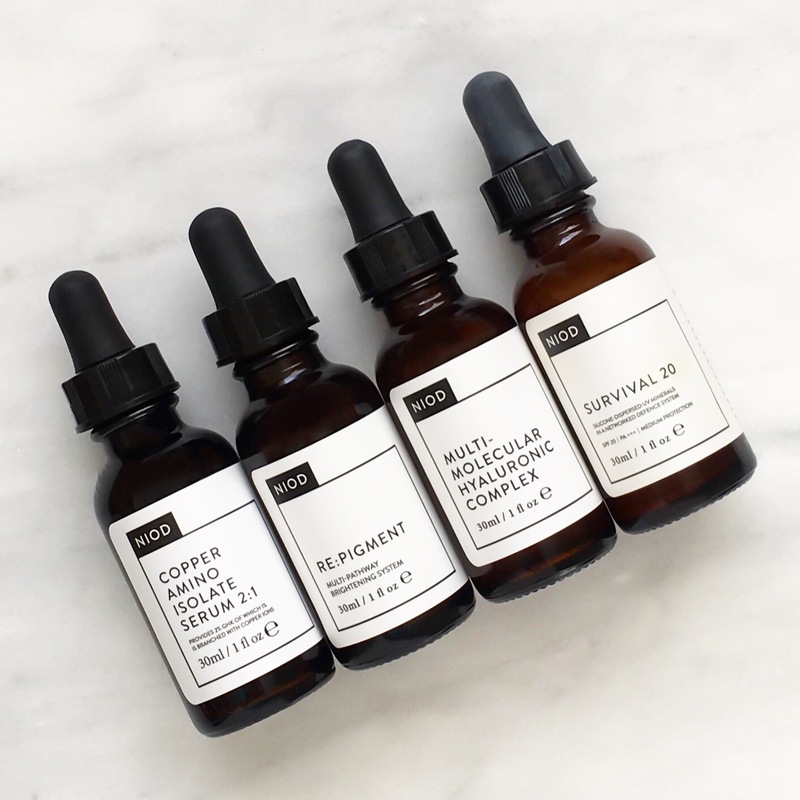 NIOD have really taken skincare to the next level this year. New “classics” like SDSM and MMHC got excellent updates, Survival launched and completely changed my sunscreen game, then came the brilliant Re:Pigment, which has quickly become one of my most consistently used products and now CAIS2 is here. It has completely lived up to my expectations and I love how Deciem are constantly improving on the products, somehow making them even better than they already were. I cannot wait to see what they come up with in 2018 and if the sneak peek of CAIL is any indication, it is going to be a very good skin year. < Previous The Debate: What Does “Self-Care” Mean To You? Hi Arly, thank you so much for your great information on Cais. I am trying the CAIS.2 after having a break from Cais.1. I get a burning sensation on my face and part of it get red and itchy too. It seemed to start after the Cais.2, then Niacinaminde and Ethylated 15% Vit c.
I stopped using everything other than the Cais.2 with my moisturiser this morning and it stung a little and then has settled. Is there a new ingredient in the CAIS.2 that I could be reacting too? Hello Karin! Hmmm, your reaction to CAIS2 is interesting as I wouldn’t expect that from this type of product. Do you normally have sensitive skin? CAIS 2 is stronger than the original so that could be it? Buffet + Copper is the same strength so maybe go back to that one? What moisturizer are you using it with? Thanks for this it’s very useful! Would this serum help with clogged pores and congestion? And if I’m just getting started is it better to try the 1% or 2:1? Hi I’m not the OP but what purifying serum would you suggest? I have dehydrated, sensitive and easily congested Skin and would love a recommendation! If you’re skin is dehydrated then that could be what’s driving the congestion. Make sure you are using a HA serum and then try something like Paula’s Choice BHA 2% directly on blemishes to heal them. Brava!!! Love the nerdery of this, Arly. It’s so very helpful. 💞 Thank you so much. I can’t even remember now how I landed on your blog but I love it and am trying to absorb every word. I have read and re-read many articles many times. I seem to go through phases with my skin care; dedicated to a great routine and products, then I begin to get lazy and take things for granted and probably get tired of spending so much $$. After taking much too long of a break from good skin care, I’m back and obsessed with getting as much information as I can. Which has lead to a bit of paralysis deciding what products to get and how to start again. I am dedicated to Vitamin C serum as I am a Florida native who has spent far too many years in the sun. I feel like I have dry/dehydrated skin but also congested pores. Is that weird? Anyhow, thank you for all the articles you write and testing you do. It is very helpful, clearly you know what you’re talking about but can write about it in a way for us novice’s to understand! Hi, I don’t normally do the “blog thing”… but I find everything you write most interesting and helpful. There have one question though: Can CAIS 2:1 be used when one suffers from Rosacea, although fairly rarely. And does it hydrate the skin? Thank you very much for your advice. Hi Frauke! I am so glad you have found my blog helpful. 🙂 I think CAIS should be fine for rosacea because it’s focus is on overall skin health and it’s not a harsh product at all. It is hydrating as it contains hyaluronic acid, but depending on your skin type it might not be enough. Hello Michelle, I actually wouldn’t recommend CAIS for your age or issues. It does have a lot of skin benefits but it is expensive, although you can get a 1% CAIS serum from The Ordinary now. For pores I would recommend niacinamide instead.